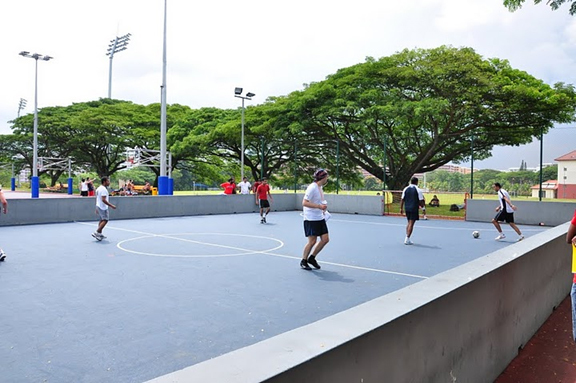 From its inception to the final handing over of the cheque to The Cambodia Trust, the first MBA Olympics among Singapore MBA students has been a journey involving fun, teamwork and positive spirit. We’re so glad to announce that the event was a success! As the event was inaugural or the first of its kind, we had a lot to plan and organise. 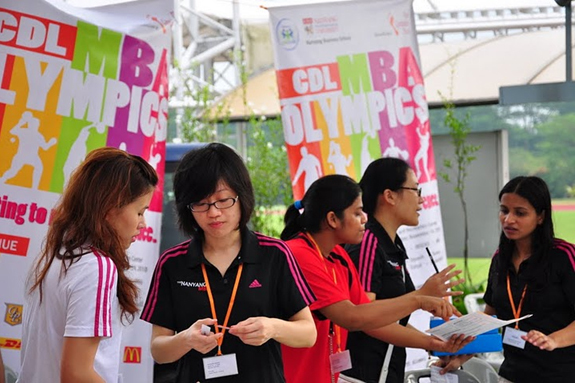 We’re truly thankful to those who made this happen, our classmates from The Nanyang MBA for volunteering their services and also to our sponsors, especially the major sponsor, City Development Limited (CDL) , and the other sponsors (CDC, SPH, GNC, DHL, MacDonald’s and Frolick) that understood the impact this event can bring. 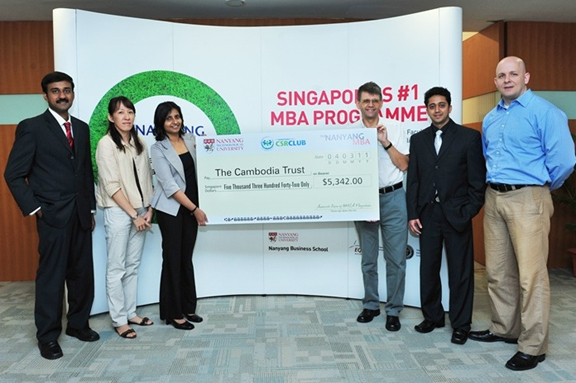 There were five business schools involved: INSEAD, SMU, NUS, S.P. Jain and Nanyang itself. There were over 90 participants, and though the competition were intense, there were good sportsmanship demonstrated throughout the day, and we all had a lot of fun! We competed in four sports, namely Basketball, Badminton, Futsal and Table Tennis. 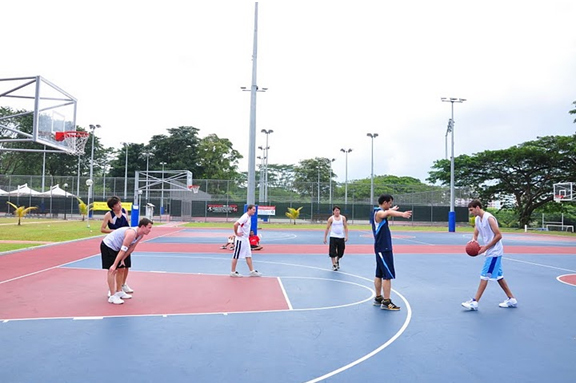 Our team did our best in the CDL MBA Olympics and Nanyang eventually emerged victorious for both Futsal and Basketball! Through this event, we managed to raise a total of $5,342 for The Cambodia Trust. The cheque was officially handed over to Michael Scott, the Country Director of The Cambodia Trust. 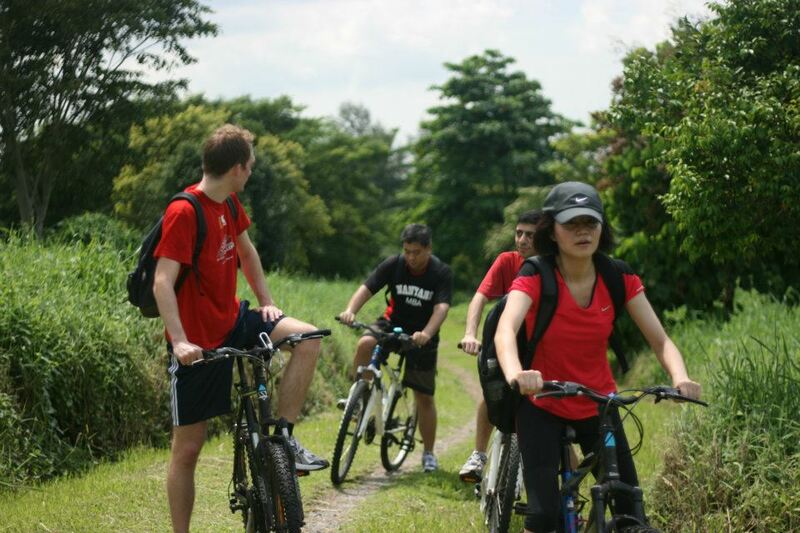 It wasn’t his first time being around Nanyang MBA students here in Singapore, and we do hope it won’t be his last. After the ceremony, Michael told us more about the various initiatives taken on by The Cambodia Trust. The new information only intrigued us further in the cause and in fact, we’re continuing to support The Cambodia Trust. This June, we’re geared up for more action. The CSR Club is exploring time to visit Cambodia! It’s only a few months away, and we cannot wait. At the end of the sporting events, we had a short gathering to celebrate the various obstacles we’d overcome and the victories that were achieved. It’s truly been a challenge but an extremely worthwhile experience for all of us, a journey we’re not likely to forget. The three of us were really honoured to work with such a capable group of people and for such a worthy cause. This heralds a new beginning for Nanyang Business School’s CSR club and we are sure it will continue to create awareness about CSR and make a difference in the society we live in. NBS was pleased to have leading sustainability guru, Professor Marc Epstein of the Jones Graduate School of Business at Rice University in Houston, Texas, speak in the recently launched NBS Dean’s Seminar Series on Sustainable Development. A Distinguished Research Professor of Management at the American business school, he has done extensive research, consulting and teaching in the sustainability area. Prof Epstein’s talk on May 6th at NTU@one-north campus focused on Sustainability and the Bottom Line – a topic that is of interest to all in the business world as it is a significant challenge to concurrently measure and manage social and financial performance. CEOs of global corporations and SMEs alike have recognised that managing stakeholder interests and the social, environmental and economic impact of corporate products, services, processes and other activities is critical for both financial and sustainability success, he said. Based on his extensive research and advisory work with leading global companies like Nike, Proctor & Gamble, Shell and Nissan, Prof Epstein described how they had successfully integrated sustainability into their businesses and increased both financial and sustainability success. The leadership challenge in corporations is the competing pressures to produce profits and to be a good corporate citizen. The good thing is that managers increasingly understand that these are linked. Already concepts like waste reduction – where you help to save the environment and “make money” by reducing wastage, and similarly improve product design to enhance efficiency, are well understood and practiced. But increasingly tremendous thought was being given to integrating social and environmental risks with huge capital investment decisions. For instance, companies have to consider what would be the impact on their business if the consumers were to boycott their products if they were to use child labour or cause oil spills and the like. Professor Epstein delivering his talk in the NBS Dean’s Seminar Series at NTU@one-north campus. “When these events occur, companies and investors are typically both surprised and unprepared. And, such events are occurring more often,’’ Prof Epstein pointed out. All companies must better anticipate external consequences of their activities and need to better anticipate social consequences. While some social impacts turn into crises, thankfully most do not, he said. Among the social and political issues businesses need to look out for are: child labour and poor working conditions, environmental emissions, nationalisation of industries, joint venture partner risks, unstable or corrupt governments, potentially dangerous products, nutrition and obesity, and interrupted or unsafe supply. At the same time there can be opportunities to convert a risk into an opportunity. For instance due to the public focus on nutrition and obesity, PepsiCo is very concerned about nutritional issues impacting its business and “is having a lot of its people look into it and look for new ways of doing business by coming up with new products,’’ Prof Epstein said. This requires more innovation and entrepreneurship from sustainability leaders, start-ups and SMEs, and more sensitivity to sustainability issues by innovation and R&D leaders, and business unit and functional leaders, he added. Driving social and financial improvements through sustainability requires strong and innovative leadership. This is because businesses need to be innovative in both products and processes, for which they need both technological innovation in products and business model innovation in processes. Prof Epstein also stressed that investors and lenders should encourage companies to integrate environmental, social and governance issues into operational and capital investment decisions. “Early consideration provides enormous opportunities for companies of all sizes to be creative, innovative and achieve entrepreneurial success,’’ he added. The talk was followed by a lively question-and-answer session. NANYANG BUSINESS SCHOOL has launched a Dean’s Seminar Series on Sustainable Development as part of its strategy of producing business leaders for a sustainable world. The inaugural talk was given by Mr Khoo Teng Chye, Chief Executive, PUB Singapore. 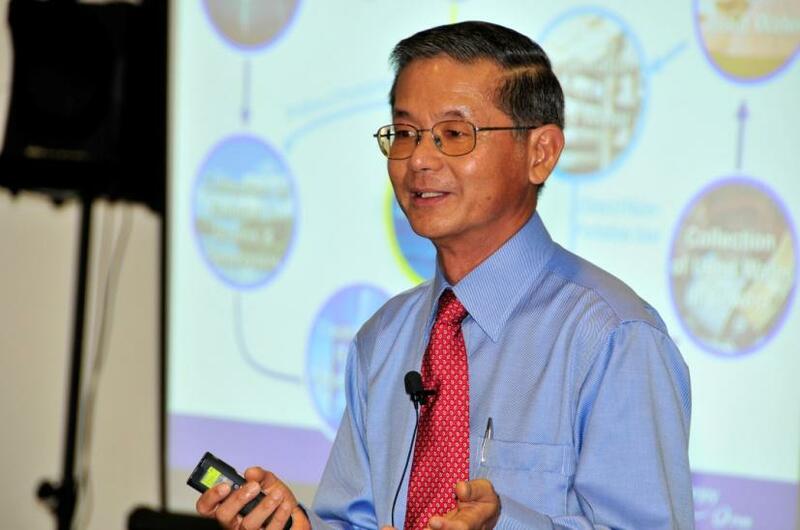 He spoke on Ensuring Water Sustainability for Singapore: Turning Scarcity into Opportunity. 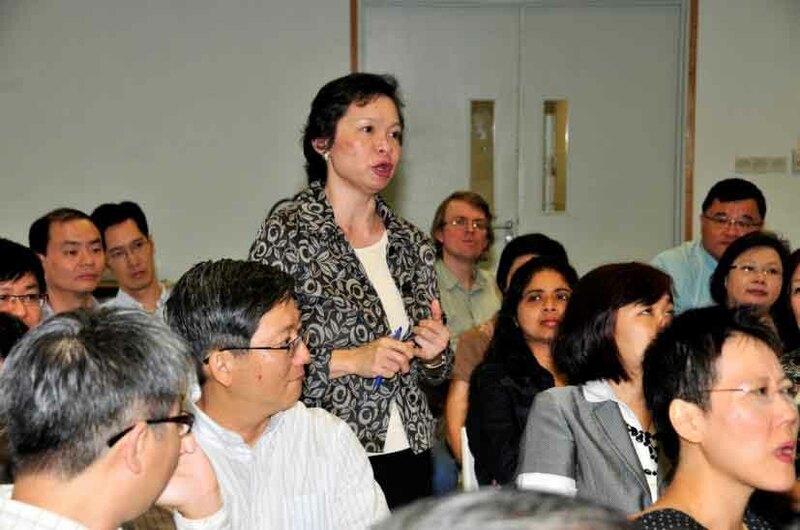 Over 70 faculty, graduate students and staff attended the talk held in the school on March 10. In her welcome remarks, Professor Gillian Yeo, Interim Dean, said that the school aims to prepare its students to become business leaders who focus on the triple bottom line of profit, planet and people. Managing the water loop: Mr Khoo Teng Chye, Chief Executive, PUB Singapore, delivering the inaugural talk. Prof Yeo said the new seminar series aims to enhance the capabilities of all at NBS to incorporate sustainability issues in the curriculum, research, policies and processes. “The seminar series will provide a forum for us to listen to and interact with outstanding practitioners and academics with deep expertise and knowledge in specific aspects of sustainability,’’ she added. In his presentation Mr Khoo highlighted that while Singapore gets enough rain, it does not have the land to collect and store the water due to competing needs of land for other uses in the small island nation. The PUB manages the whole water cycle, key to which is the use of membranes to reclaim water. The national water agency aims to provide “Water for all”. This is coupled with the approach to involve the community and companies to Conserve, Value and Enjoy the water. Singapore has four national taps: local catchment, imported water, NEWater and desalinated water. As water is a valuable resource, the PUB would like all to help conserve it, value it and enjoy it. While half of Singapore was already water catchment area, this is being increased to two-thirds by 2011 through an urban storm water collection system and raising the number of reservoirs from 14 to 17 by the addition of Punggol and Serangoon reservoirs and the Marina Barrage. Mr Khoo said that a combination of strategies was used to achieve water sustainability for Singapore. The effective use of membrane technology to produce NEWater means that it can meet 30 per cent of the country’s water needs this year. However, only 2 per cent was being added to reservoirs for public consumption, while direct supply was being made to industrial users in view of the high quality of the water. Desalination was expensive compared to using membrane technology, which had brought down the cost considerably. At the same time a water conservation strategy was employed based on pricing, voluntary and mandatory approach. As a result the per capita consumption of water had dropped significantly since 2003, he added. 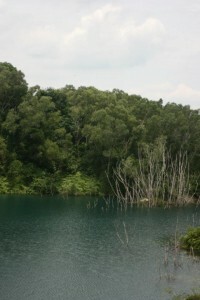 As water is an important resource, the National Research Foundation has set aside $330 million over five years as part of the efforts to grow Singapore water industry with the target to increase the value add from $0.5 billion to $1.7 billion and double the number of jobs to 11,000 by 2015. Singapore aims to become a global hydrohub with technology as the key pillar based on cluster development, technology development and internationalization. Already there is a vibrant water industry here with many international players in R&D activity, regional operations and business headquarters. The R&D ecosystem includes the Nanyang Environment and Water Research Institute at NTU and several other public and private R&D centres. Mr Khoo highlighted that over the last three years there had been a five-fold increase in the value of overseas water related projects secured by Singapore companies. The marketing and branding of Singapore water industry was being done through engaging with international organizations and organizing the Singapore International Week. Mr Khoo said Singapore universities could play a role in developing the water industry through education, research and consultancy. Particularly, there is a need to develop water entrepreneurs. The water industry needs business managers, not just technical experts. Research and consultancy support is needed to bring new technology to market. The financing of water projects, water pricing and regulation, and climate change issues were some of the other areas that need attention, he added.